In our post yesterday about Melanie Shaw’s conviction on three counts of arson, we alluded to, but did not elaborate upon, the Tommy Robinson/fringe right wing connection. Robinson (real name Stephen Yaxley-Lennon) adopted the #FreeMelanieShaw mantra last month, which initially puzzled a great many people who failed to see the connection between Robinson’s case and Shaw’s. However, given that those who follow the UK Column and David Icke have bought their story that Shaw is a “political prisoner” or “wronged whistle-blower” rather than a damaged and exploited person badly in need of mental health intervention, it’s easy to see why Robinson, along with others such as UKIP leader Gerrard Batten, might wish to hitch a ride on the coattails of her standing in the conspiracy community. Certainly, others have tried to do the same. On Wednesday 11 January 2016, Melanie Shaw, the whistleblower on the horrific abuse of children which occurred at the then county council-run Beechwood Children’s Home in Nottinghamshire in the late 1980s, was given a two-year custodial sentence in a secret court hearing. Melanie Shaw did not appear in person in court for this hearing, which was conducted by video link from her prison, as has also been the case with previous of her court ‘appearances’. She states that without fail, whenever in the past she has given testimony by such video link, she has been cut off on the pretext that “you were shouting”, which she denies. In addition, UK Column News is very confident that at this particular secret hearing, no member of the public was present, and particularly not any of the supporters who have been following Melanie Shaw’s case very closely. The public is therefore entirely dependent on any transcripts—accurate and complete or otherwise—which may be produced in order to find out what was said at the hearing. The dark assumptions of “secret court hearings” and stifled evidence confirm conspiracy believers’ belief that we live in a Kafka-esque dictatorship, where brave whistle-blowers are silenced and the public is placated with potentially inaccurate reports of what actually happens inside the closed court. It suits people such as Robinson and Batten to ensure the public believes the UK Column version of Shaw’s story, as the more firmly they can convince their followers that they are being repressed, the easier it is to convince them that they possess the political/mob-based answers. No real press freedom, please! Interestingly, though, when Robinson was arrested and a journalist—Stephanie Finnegan, who reported on Shaw’s most recent case and was attacked on Tuesday by Twitter trolls for her trouble—fought to ensure the public’s right to know what was happening, she found herself on the wrong end of a howling mob of Robinson’s supporters. This shows not only the importance of having local court reporters who attend court daily, but also the importance of having a social media presence and using it responsibly. Since then, I’ve received threats to harm me and members of my family, both physically and sexually. So the response to a reporter fighting to ensure the public’s right to know about an arrest and court proceeding ended with the reporter receiving physical and sexual threats. While the post-verdict reaction in Shaw’s case has not reached the fever pitch that Robinson’s attained, Robinson’s followers seem prepared to go to bat for Shaw, and Finnegan is a convenient target for some: “You seem a bit touchy! We were only having a laugh”…Uh-huh. We fully expect that, just as certain fringe-right and ultra-religious people have attempted to latch onto the Hampstead SRA hoax as a means of furthering their own agendas, others will continue to hop aboard the UK Column/Melanie Shaw Express. After all, violent yobs look a lot less threatening when they can pretend to be fighting for the rights of an imprisoned woman. The problem for Tommy is that if Shaw saw through McKenzie then she’ll easily see through him. Might be funny to see someone feted by the far right as a cause celeb turn on them the first chance she gets. Disturbed and mentally ill she may be, stupid enough to be do easily manipulated ? We’ll see. Unfortunately, she’s been manipulated for years by Gerrish et al, and won’t hear a word against them. However, it’s entirely possible that she’ll give Robinson the Belinda treatment, when she’s in a position to do so. Unpredictable. Never wise to get involved with somebody who could turn on you. I get the impression that these whiny little fuckers would not be content if Stephanie Finnegan did go beyond her court-reporter day-job, and investigate Shaw’s claims of human-rights abuse “like a proper journo” — because they’re too lazy to do the work themselves — only to conclude that she’s just another narcissistic fabulist. Yes, there’s nothing anyone can say or do which will alter their pre-formed opinions. All the TR fans are the ones obsessed. There are two people on FB that have had a sentence of 16 weeks starting tomorrow who are calling on Tommy Robinson to help them because they attended one of his rallies. They will have found out by now that he doesn’t give a damn about small fry that won’t get him headlines. Why would they ask knob heads who fail every time for help ? Surely a decent solicitor is what they need. Too late for that, allegedly they appealed a suspended sentence for allegedly harassing a judge & received prison sentences. Stephanie Finnegan should be congratulated to standing up to these miserable cowards. As others said, they lazy sods can’t be bothered turning up to Shaw’s court case (either could Robinson) so they attack someone for merely doing their job. Surprised they aren’t attacking court officials or members of the jury (now you see why they should remain anonymous) and so on. There have been no secret court cases regarding Shaw and there are no secret courts. 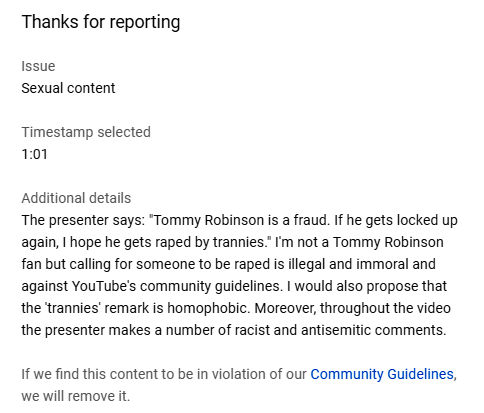 There are however reporting restrictions if needed such as in custody matters for children or in the “TR” Robinson fiasco as requested by the Prosecution to protect the sanctity of the trial process. # These phony “patriots” are a joke. They can’t even be bothered following how Britain’s courts have worked for decades and they prattle on about an imaginary England they think they once lived in. “The Australian Antipaedophile Party nominated a total of four senate candidates (one each in New South Wales, Northern Territory, South Australia and Tasmania), and one House of Representatives candidate (for the Division of Robertson) in the 2016 federal election. The South Australian Senate candidate, Ronald Waters, had a past conviction for being an accessory after the fact to two murders at a massage parlour in New South Wales in 1994 by Lindsay Robert Rose. The spent conviction would not disqualify him from sitting in parliament. Despite all the misguided troofers’ sob stories, neither Robbingsod nor Shaw are political prisoners. Shaw’s a serial arsonist whose previous convictions include one for trying to set fire to a house that had two sleeping children and their parents inside; and Robbingsod’s a crook and a thug who has a string of convictions for violence and fraud. Not so much had been exposed about them and Jon Wedger (squidgy widgy), was still in the backgound then. Wait till she catches up and sees Maloney’s pleas for amnesty video. Robinson has sacked his lawyers, for which tens of thousands£ were raised to pay. I think he’s decided he’s going down anyway and hopes to keep the cash and hopes much more will flow in as he becomes a Martyr. And far from being denied a TV set as he claimed (despite claiming certain reality TV programs kept him sane) he may well have decided on an easy life inside for a time while funds increase. Does he work?. Probably write a book while in jail for his rusted-on fans as it would surely be a good seller. He could call it My Fight (Mein Kampf for his German fans). Or maybe the public will just forget him and move on. “thousands (surely an exaggeration) of our city’s ex institutional kids who suffered horrid rapes etc”. Kids?. Now adults surely and capable, certainly in today’s atmosphere of abuse accusations :”believe the victim” : of reporting their alleged abuse to authorities. And perhaps they have. Why wouldn’t they? There is ready acceptance with the police to investigate and most especially if 2/3 or those “1000s” come forward. During all of Shaw’s time there have been investigations into so-called powerful pedo rings (Ted Heath?, a treasured war hero?) and police have never been backward in coming forward in encouraging anyone and everyone to come forward even when it is a fantasist like “Nick”. I have no idea of the truth here but it seems to me Shaw has been intent on claiming the mantle of “whistle-blower” when she is just one of dozens who may well have taken action but preferred privacy. I would think that perhaps other victims who have been in the same institution may want to completely ignore a loose cannon like Shaw. IICSA was in Nottingham last week receiving testimony from victims of abuse in Nottingham care homes. Victims have gone to the police and there have been convictions and long prison sentences. No question some horrible things happened in Beechwood and other homes in the City. All of which confirms broadly what Melanie Shaw is saying in that post; “thousands” may be an exaggeration, but since there have been 903 allegations and 379 people have come forward, one thousand is certainly a plausible figure. And that’s just in one home, the police are investigating 22. Minimising or denying this experience isn’t fair or even rational given so much corroboration. What it doesn’t confirm is the allegations of Brian Gerrish that this is being covered up, or nothing done, or that VIPs were involved. There have been trials, sentences, press reports, and a public enquiry. But the fake gloss put on the real experience doesn’t nullify the experience. 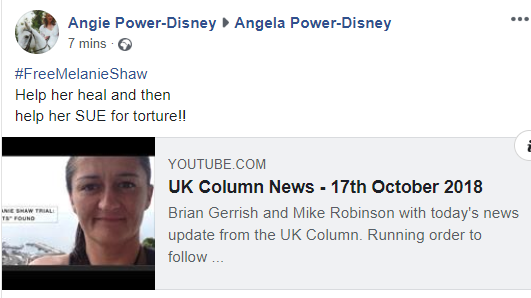 The other thing the post does is show us the real Melanie Shaw rather than the creation the UK Column has wrapped her name around. I watched a little of the live feed for ICCSA which was showing a hearing held today. There were people giving evidence about records. There are several further hearings and there are several core participants due to give evidence. I hope if Melanie Shaw wanted to give evidence she has been given every opportunity to do so. Then it will be a wait for the final reports. It certainly isn’t being covered up, or at least finally people are actually trying to get to the bottom of what happened. I do have a problem with campaigns from the Brian Gerrishes of the world who ignore what other survivors have been doing to get justice. I also have a problem with who is using the #freemelanieshaw hashtag. I checked their profiles and other tweets. This is supposedly a message to Hoaxtead from some retard. Poor little guy’s doing his best to get you to notice him so i thought I’d help. What’s the relevance of the security guards’ skin colour, Neelu? Off topic. This is brilliant. Anyone heard of Seth Andrews? Yes, it’s really excellent, thanks for sharing! Well this is going to be interesting. 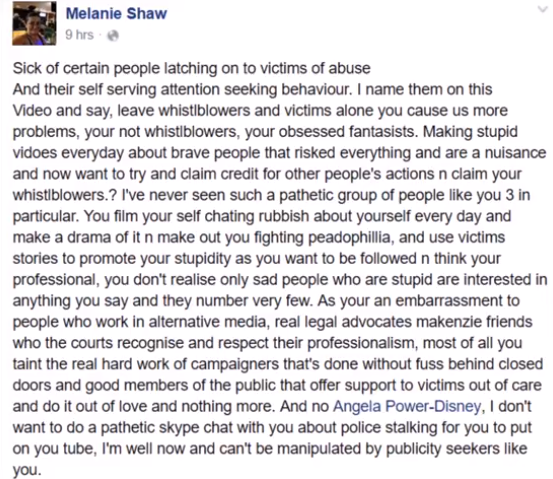 Melanie Shaw is very outspoken on people who aren’t victims of CSA or whistleblowers. So she can either lend her support to Tommy so-called Robinson and his racist hijacking of CSA and look like a complete hypocrite or maintain her often stated stance and slate the racist. She can’t possibly maintain her position without all her new supporters getting bent out of shape. It’s all getting jolly queer and headed for a right old mess as everyone involved tried to make head or tail of what’s going on. The Twitter hash tag #freemelanieshaw has just over 300 tweets while #hampsteadjustice has over 400. So you know what to tag on any tweets about Melanie’s predicament. It’s going to be very interesting watching the saga play out, especially when / if Melanie herself gets an opportunity to voice her views on Tommy. I don’t think it’ll be quite what the edl types are hoping for. Mind you if Tommy and co didn’t understand basic journalism no nos like contempt of court, even when a nice judge explained in in very simple terms, how would they know the ins and outs of the fake news CSA Muppet journalism community ? This is going to be fun. Can’t possibly maintain her position without her new supporters getting . . . .
EC, please rectify that so it makes sense. I’m too close to my data limit for watching videos of Tom Dunn (😫oh nooooo !!!) But I can easily follow Twitter. The #freemelanieshaw hashtag has a fair few posts (though less than the reappropriated #hampstead justice – big shout out to Mickey of the mouse there) and most of them are either unlocked or just a solitary bit of interest). So it’s hardly spreading beyond people just posting stuff that lies fallow. Melanie is an interesting character as she’s pretty much being presented as this silenced whistleblower banged up as part of a government cover up. The fact she’s inside thus far presents her acknowledging her new found credentials as the poster girl of far right anti Islamic hatemongers to support Tommy Robinson’s position as a child’s rights campaigner. For all her faults Melanie is an outspoken victim of child abuse who does want to engage in a public discussion of institutionalised sexual exploitation. Putting her on a podium to a much larger audience when she finally has the opportunity to speak out is going to be revealing to say the least. Personally I’d relish hearing her opinions on the other Tommy, the right honourable Mr Dunn and his basement bargain industry selling Hampstead. Don’t know how long it’ll take for this situation to play out or if she’ll be forgotten by then but it’s certainly got the potential to be very interesting. I definitely hope she gets the care, support and assistance she needs to recover and lead a happy and less stressful existence beyond institution walls and not be used as some puppet for nefarious political scams. I really need to keep an eye on that spellcheck and proofread more diligently as my posts are riddled with inconsistencies. I need an editor.